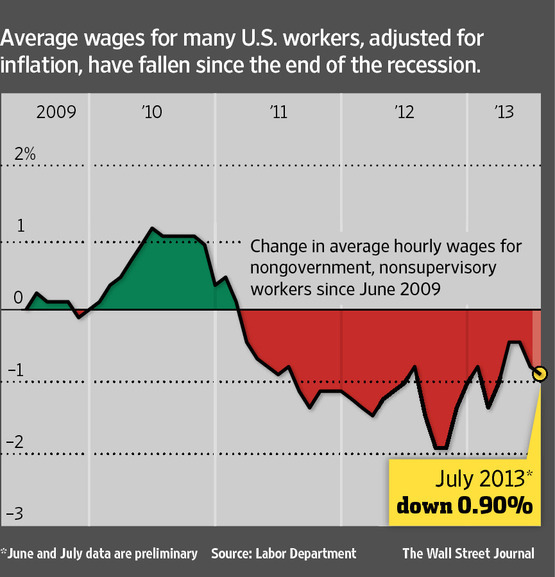 Four years into the economic recovery, U.S. workers’ pay still isn’t even keeping up with inflation. The average hourly pay for a nongovernment, non-supervisory worker, adjusted for price increases, declined to $8.77 last month from $8.85 at the end of the recession in June 2009, Labor Department data show. In other words, as the chart below illustrates, the great majority of workers are experiencing real wage declines over this expansion. 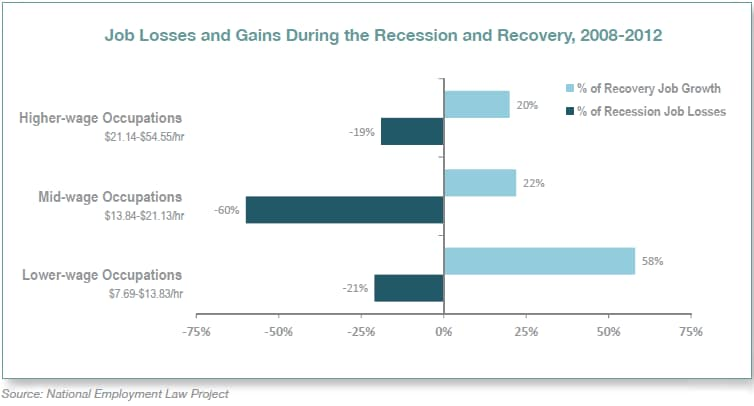 Growth also remains sluggish, increasing “at a seasonally adjusted annual pace of less than 2% for three straight quarters—below the prerecession average of 3.5%.” But by intensifying the pace of work and reducing the pay of their employees, corporations have been able to boost their profits despite the slow growth. The following chart from an Economic Policy Institute study shows the continuing and growing disconnect between productivity and private sector worker compensation (which includes wages and benefits) using two different measures of compensation. The point then is that we need a real jobs program, one that is designed to create new meaningful jobs and boost the well-being of those employed. Government efforts to sustain the existing expansion have certainly been responsive to corporate interests. It should now be obvious that such efforts offer workers very little. While U.S. cable and cell companies like to boast of the speed and affordability of their internet services, we are far from the top on either count. According to the State of the Internet Report First Quarter 2013, which provides data on average and peak connectivity speeds throughout the world, the U.S. trails South Korea, Japan, Hong Kong, Switzerland, the Netherlands, Latvia, and Sweden. The figure below shows that the U.S. leads in the Americas, with an average connection speed of 8.6 Mbps (megabites per second). As we see next, South Korea, Japan, and Hong Kong have much faster average connection speeds. And as the figure below shows, Switzerland, Netherlands, Latvia, and Sweden–although trailing the leading Asian countries–also have faster average connection speeds than the United States. U.S. internet companies generally embrace these rankings, which come from Akamai–a content delivery network–despite the U.S. eighth place finish. The reason is that the U.S. looks far worse in other rankings. Pando Networks, another content delivery network (CDN), puts US high-speed Internet access speed at 26th worldwide, at about a quarter of the speed of world leader South Korea. According to PandoNetworks, Eastern European nations dominate the top of the list (Romania, Bulgaria, and Ukraine), with speeds that are about double or triple those in the US. M-Lab also puts the US somewhere in the middle, slower than Belgium, Denmark, Finland, Germany, Hungary, Japan, Luxembourg, Netherlands, Norway, Sweden, and Switzerland. If we look at just Netflix subscribers, and focus on just streaming video speed, the US sits just ahead of the UK and Ireland, well ahead of Mexico, but behind all of the Nordic countries. (Netflix reports on only these countries). Comcast, the nation’s largest cable provider, claims it’s capable of providing 3Gbps broadband — but its fastest service currently on the market is $320 a month for 305Mbps. Verizon, meanwhile, has just announced its fastest FiOS ever, 500Mbps for $310 a month. Compare that to Hong Kong, where consumers can get 500Mbps for $25 a month, or Seoul, where the same speed is priced at $30 a month. An American’s only choice when he or she wants to buy a high-capacity connection to the Internet, in most parts of the country, is his or her local cable monopolist. The large cable distributors in America – who never compete directly with one another – have clearly become the nation’s monopoly suppliers of terrestrial wired connections, each in its own footprint. Their market power is unrestrained. They can charge whatever they want for whatever services they choose to provide. They have little incentive stemming from either market pressure or oversight to upgrade to symmetrical fiber, which is the world standard, or to charge reasonable prices for world-class access. Meanwhile, our former telephone companies, Verizon and AT&T, have retreated almost entirely to wireless services – complementary, non-threatening to the cable guys, and highly lucrative. . . .
(T)he relevant market for everyone is (or should be) high-capacity, low-latency, symmetrical fiber connections to homes and businesses of at least 100Mbps. That’s what they have in South Korea, Japan, Sweden, and (soon) Australia and China. Right now, the vast majority of Americans are stuck with the cable guys’ product, which is very expensive (three or four times as expensive for the same download services as in other countries) and second-best (because it doesn’t provide symmetrical, or equal, upload capacity). It’s not fiber, and it’s under the complete price/service control of individual companies that, again, are subject to neither oversight nor competition and have no incentive to make the upgrade to fiber. The United Nations Conference on Trade and Development (UNCTAD) recently examined the causes of rising inequality in developing and developed countries. In what follows I discuss its analysis of the developed country experience, particularly the United States. As its 2012 Trade and Development Report (TDR) notes, economists are well aware that the post-1980 growth in inequality has been accompanied by accelerating technological change and globalization. Studies in the 1990s attempted to determine whether technological change or globalization best explained the rising inequality over the 1980s and early 1990s. The eventual consensus was that the primary cause was skill-biased technological change. In other words, as production became more complex, businesses needed workers with ever greater skill levels and were willing to pay a premium to attract them. This boosted income inequality and the only reasonable response was greater skill acquisition by lower paid workers. Drawing on more recent work, the TDR argues that this consensus needs to be reconsidered. It finds that the post-1995 inequality explosion is best explained by globalization, or more specifically transnational corporate globalization strategies. The new aspect of income inequality in developed countries – also termed “polarization” – concerns employment in addition to wages. The trade-inequality debate in the early 1990s focused on the divergence between the wages of high-skilled and low-skilled workers. However, the more recent period has been characterized by a very different pattern of labor demand that benefits those in both the highest-skill and the lowest- skill occupations, but not workers in moderately skilled occupations (i.e. those involved in routine operations). The moderately skilled workers have been experiencing a decline in wages and employment relative to other workers. The chart below shows that in the United States the 90-50 ratio has steadily grown, reflecting increased earnings for those at the top relative to those in the middle of the income distribution. However, beginning in the 1980s, the 50-10 ratio largely stopped growing. In other words it is the hollowing out of the income distribution that underpins current inequality trends. And, according to UNCTAD, this hollowing out is largely due to the destruction of middle income jobs. As the next chart shows, this polarization of employment has taken place in almost every developed capitalist country, which helps to explain the almost universal growth in income inequality in the developed capitalist world. UNCTAD argues that this development is primarily the result of the growth in transnational corporate controlled cross-border production networks. Competition between leading transnational corporations drove them to find new ways to lower costs. Their preferred strategy has been to divide their production processes into discrete segments and then locate as many segments as possible in different low-wage countries. They control their respective networks through direct ownership of the relevant foreign affiliates or increasingly through their control over the relevant technologies and/or distribution channels. These networks have helped leading transnational corporations increase their profits. Their operation has also transformed developed country economies, reducing mid-level jobs and earnings as well as increasing dependence on imported parts and components as well as final goods and services. As the above chart shows, most of the world has been affected by this development, although the rise in U.S. imports from low-wage countries, primarily from China, stands out. Having said that, it is worth emphasizing that most U.S. imports from China are produced by foreign owned firms operating in China–often under the direction of U.S. transnational corporations–not Chinese companies; Apple products are a good example. Sector-specific evidence for the United States for the period 1990–2000 indicates that all of the four sectors with the largest growth in productivity (computers and electronic products, wholesale trade, retail trade and manufacturing, excluding computers and electronic products) experienced positive average employment growth, adding a total of nearly 2 million new jobs. By contrast, the sectors with the largest productivity gains during the 2000s experienced a substantial decline in employment. Computers and electronic products, information, and manufacturing (excluding computers and electronic products), accounted for a sizeable share of overall productivity growth, but employment fell, with a loss of more than 6.6 million jobs, about 60 per cent of which occurred before the onset of the Great Recession of 2008. The evidence presented in the chapter indicates that, in developed countries, the effect of the forces of globalization on income inequality since the early 2000s is also largely due to behavioral changes in the corporate sector in response to greater international competition. Companies have given less attention to upgrading production technology and the product composition of output through productivity enhancing investment with a long-term perspective; instead, they have increasingly relied on offshoring production activities to low-wage locations, and on seeking to reduce domestic unit labor costs by wage compression. This trend has been associated with a polarization of incomes in developed countries. For the United States, evidence suggests that a new mode of corporate governance aimed at the maximization of shareholder value is pushing corporations to maintain external competitiveness through wage repression and offshoring, and to increase profits through, often speculative, financial investments, rather than by boosting productive capacity. Despite the declining rate of unemployment—-it fell to 7.4% in July, the lowest level since December 2008—it is clear that economic trends, especially the rate and nature of job creation, are far from desirable. The U.S. labor market’s long, slow recovery slowed further in July—and many of the jobs that were created were in low-wage industries. Employers added a seasonally adjusted 162,000 jobs in July, the fewest since March, the Labor Department said Friday, and hiring was also weaker in May and June than initially reported. Moreover, more than half the job gains were in the restaurant and retail sectors, both of which pay well under $20 an hour on average. . . . The falling jobless rate reflects to some degree a pace of hiring that, though slow, has remained steady over the past year even as the broader economy has grown in fits and starts. The U.S. has added an average of 192,000 nonfarm jobs per month so far this year, hardly a robust pace but more than enough to keep up with population growth. But the drop in the unemployment rate is also the result of a job market that remains too weak to draw back workers who have dropped out of the labor force. Some 6.6 million workers say they want a job but don’t count as unemployed because they aren’t actively looking, a number that has barely budged in the past year. The number of Americans working or looking for work fell by 37,000 in July; as a share of the population, the labor force remains near a three-decade low. . . . The day before the president’s visit, the Internet retail giant said it was adding more than 5,000 full-time jobs in its distribution centers across the country. Many of the jobs pay $11 an hour or less, although the company said workers will qualify for health insurance and other benefits, including stock grants and tuition subsidies. “In our viewpoint these are great jobs,” Amazon spokeswoman Kelly Cheeseman said. But the proliferation of low-wage jobs is leading to anemic growth in incomes. Average hourly wages were up by less than 2% in July from a year earlier, continuing a pattern of weak wage growth in the recovery. A broader measure of income released by the Commerce Department on Friday showed that inflation-adjusted incomes actually fell slightly in June. The following chart, from a Washington Post article, helps highlight the problematic nature of U.S. job growth. By far the greatest number of jobs lost during the recession were mid-wage jobs. And by far the greatest number of jobs created during the recovery have been low-wage jobs. No wonder workers are struggling to make ends meet—job creation is weak and most of the jobs being created are low paying and part time. But it is not like corporations don’t care. For example, McDonald’s Corporation teamed with Visa to offer its workers a helping hand: a web page with advice about how to budget better. This must be a great help to workers that earn on average about $8.25 an hour. The McDonald’s working budget, shown below, is a bit hard to interpret. What is clear however is that the company expects workers to have two jobs, pay $20 a month for health care, nothing for heat, $600 a month for rent, and . . .
For insight into what it is like to live on a McDonald’s wage, check out the Bloomberg story on Tyree Johnson, a 20 year employee still making minimum wage. Corporations like McDonalds don’t pay these low wages because they are hurting but rather because they help their bottom line, as the following graphic from the Bloomberg story shows. Corporate apologists often argue that these jobs are just “starter” jobs for high school students seeking to earn money for some extra like a smart phone. But as the New York Times notes, only 14% of those earning between the minimum wage and $10 an hour are less than 20 years old. In recent weeks, workers from McDonald’s, Taco Bell and other fast-food restaurants — many of them part-time employees — have staged one-day walkouts in New York, Chicago, Detroit and Seattle to protest their earnings, typically just $150 to $350 a week, often too little to support themselves and their families. More walkouts are expected at fast-food restaurants in seven cities on Monday. Earlier this month hundreds of low-wage employees working for federal contractors in Washington walked out and picketed along Pennsylvania Avenue to urge President Obama to press their employers to raise wages. These workers are taking real risks and if successful their gains would likely boost living and working conditions for most U.S. workers. They deserve our strong support.